First and foremost, modern and future settings should primarily feature (and focus on) ranged weaponry. Lightsabers are fun, I get it, but they only work because of magic (the "force"). Since I want Stellar to be less about fantasy and more about technical sci-fi, a dude with a glowbat is going to look pretty silly and die pretty fast, no matter what his religious beliefs about midichlorians are. Also, most weapons should be fully automatic, or at least capable of that if sufficiently powered. And also, there are more indirect fire weapons in modern combat than in historic combat. 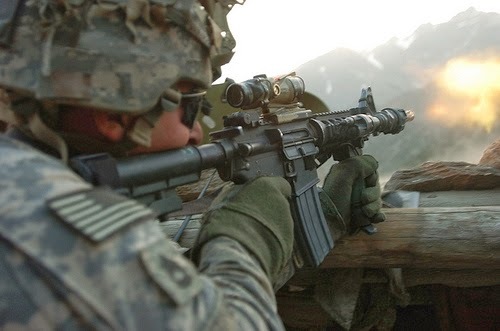 Virtually every squad in the US Army has at least one grenade launcher attachment for their rifle. Simply put, only an idiot fights a modern combat without cover. The battlefields need cover, and the characters need to use it. Next, basic fire team movement should be a viable and sensible tactic. For those without military experience, fire team movement is the process by which a fire team (small group of soldiers) moves forward or laterally on a battlefield. It works like this: one or more combatants lays down suppressive fire, discouraging and/or distracting enemies, while the remainder of the fire team sprints towards the nearest point of cover. That group then lays down their own suppressive fire, allowing the first folks to join them (or preferably pass them, in a sort of leapfrog fashion). In this manner, the fire team can move from cover to cover, with the lowest possible risk for an admittedly lethal situation. Try doing this in a game like D&D, and it doesn't work, in any edition. An archer, even if given the perfect position, is incapable of laying down suppressive fire that allows allies movement at a reduced risk. I believe this is due to two reasons. First, the damage that archer does is not very lethal on its own, especially at higher levels. Second, despite being on the same team, characters don't really work "together" in any meaningful mechanical way. Sure, I can give someone a buff, or heal them, or ask the GM if I can help lift them up a tall tree, but we feel a lot more like a bunch of individuals instead of a team. In a team, our actions directly affect the success of our mates' actions. 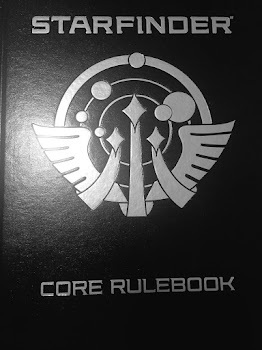 So, I need to make Stellar weapons more lethal and I need to make players feel more like a football team instead of a golf team. These haven't been meaningfully playtested yet, although BabyBat and I have dorked around a bit with them. First, HP will be low, on the order of 5 or less per character. Second, to provide dynamic padding and fun utility, I'm introducing Powered Armor for ground combat. This can provide a portable power source for shielding and toys, which will have downstream design impact. For instance, a jet pack could use some of the armor's power for enhanced movement. The armor will have limited power for use in each combat, but much like the space fighter combat I've previously discussed, having the ability to regenerate shielding during combat will effectively provide dynamic HP totals. Smart or creative or timely use of power will give players extra tactical options. Third, cover is assumed. Out in the open? Then opponents get a bonus to hit you. This flips the normal cover mechanic (take a penalty if target is in cover) and flips it around. It reinforces that you get hit harder and die faster if you walk around casually like an idiot while people try to kill you. Which is true in almost every game, but not as inherently obvious, nor as important with swords as it is with automatic laser rifles. Fourth, party initiative. How's that for OSR? It's important, though, because to feel like a team, the team needs to act together. This reinforces that concept and underscores the theme. For initiative, every team member on the same side rolls their ground assault check, and everyone on the team adds their results together. Whichever team has the highest score moves first. When a team's turn comes up, they are considered the "offense". Each member can take one action, like automatic weapons firing, or movement. They can declare these in the preferred order as a team. One of the actions an attacker can take is "suppressive fire". They declare the area affected by that fire, creating a sort of special zone. This is important because the other team, the "defense", can each perform one reaction. A reaction is a quicker, smaller type of action. Reactions can't ordinarily be used to move, but they can be used to fire a quick shot or drop to the ground (like behind cover). Trick is, if an enemy in a suppressive fire zone uses a reaction that exposes them to the suppressive fire attacker, then the defender is attacked by that suppressive fire. Since lethality is higher, that can be a big risk. When the offense is done, then the defense becomes the offense (and vice versa) and it all starts over. We'll see how this works in an actual playtest, just as soon as I can get some players together for it.